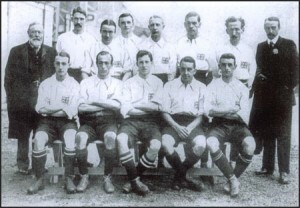 Mike Adamson, writing in the Guardian, points out that this is the oldest England squad to travel to a finals. It surprises Rob Marrs too. The squad’s average age is 28.7, older than England’s awful nadir squad of 1954. It could have been older. Over at Attacking Soccer, Anthony reminds us that Joe Hart has a real chance to become the youngest keeper to turn out for England at the World Cup. Anthony’s survey of Hart’s predecessors throws up something interesting: at their first Finals, most of England’s keepers have been 27 or 28. But the greatest performances – Banks in 1970, and Shilton twenty years later (plus a mention for David Seaman’s pre-2002 performances, especially Euro 96) – have come from men in their 30s. It’s interesting too, because one story of the 2010 squad is of goalkeeping decline. No Robinson (aged 30), no Foster (aged 27), no Scott Carson (aged 25), no Chris Kirkland (aged 29). Hart is on the plane aged 23. Of course, form (Foster), fitness (Kirkland, most regrettably) and luck (Robinson and Carson) account for much of this, and in any case, I’ve not heard any great outcry at England’s failure to pack 7 keepers in the bag. But the squad tells that story nonetheless, and there are others. For instance, who would have imagined, back in 1998, that no fewer than six of that squad would be plausible selections for the 2010 party? Having won nothing for their country in the meantime? Rio Ferdinand went to France as a young hopeful to gain experience, of course, and this is now his fourth World Cup. But Paul Scholes was sought out by Capello, Beckham is injured, and Gary Neville may have been only another right-back injury away from at least a squad place. Michael Owen is injured, and had he not been, there are those of us who can’t quite see why Defoe would travel in front of him. And then there is Sol Campbell’s extraordinary return to Arsenal, and some fine performances which must have at least brought him up in Capello’s conversation. In 1998, and even more so in 2002, there was a feeling of youth breaking through: Joe Hart aside, there has been nothing of that this time. Adam Johnson has considerable support amongst both fans and journalists, more than SWP. But put up against the ’98 group of Scholes, Beckham, Owen and, but for injury, a 23-year-old Robbie Fowler, and the class gap becomes more obvious. Johnson is a good player. But no one would argue that he is in that kind of class, at least not yet. It isn’t a failure of England’s young players. Both the U-21s and U-17s have enjoyed great success recently. Arsene Wenger has spoken warmly of the coming generation, now in their mid teens, and even Trevor Brooking has begun to change his tune. It’s more that for Huddlestone, for Walcott, for Johnson, for Carlton Cole even, 2010 is tangibly too soon. If Capello stays, and rebuilds England in time for 2012, their time will come. Don’t worry for Walcott: take comfort in the criticisms that Joe Cole and Cristiano Ronaldo had at one stage. He’s not the first talent to be accused, when young, of having no game or team awareness. A look at previous squads reveals that even in this most consistent and medal-laden of England cores, there have been drop-outs. What an exciting player Kieron Dyer once was – a match for Lennon and far superior to SWP. And how promising Jermaine Jenas too – possessed of a captain’s temperament and the energy of a Roy Keane. All he had to do, it seemed, was bulk out a little. There are others: Jonathan Woodgate, once considered worthy of a starting place at Real Madrid, but always, heartbreakingly, injured. In an alternative universe, somewhere, he has 80 caps and has partnered King at the heart of the England defence for the best part of six years. And how many strikers – Michael Bridges and Alan Smith stand out, two men who looked the part at first, but were carried away by injury and bad luck as time went by. Dean Ashton, a man in the Alan Shearer mould, never got a chance. There are so many nearly but not quites: genuine Premiership strikers who look just a little lost in a three lions shirt. Will Bobby Zamora be one? Already paid-up members from the post-98 era: Darren Bent, Andy Cole, Kevin Philips, Andy Johnson, Franny Jeffers, David Nugent.. This England squad would do superbly well by reaching a semi-final, but I’d settle for a quarter: Gerrard is already coming out with the “we can play better than this and we will” comments familiar to anyone who followed the 2006 campaign and the 2008 qualifiers. But Capello does seem to know what he’s doing – as has been pointed out elsewhere, Ericksson’s “first half good, second half not so good” has been usefully reversed. The United States will beat England and win the group, but beyond that – not banana skin, more landmine – there are only three teams who are really streets ahead (the two South Americans plus Spain) and if England can avoid them, find form and find goals, they’ve a three-week stay ahead of them. And there is a story for the manager to tell them. There is still, just about, a narrative here. It’s one more thing that Capello has given England: plot. Once it was that a brilliant European manager would find his talents just a little too young and too soon for 2002, but 2004, 2006… and then 2006 came and went empty, to be followed by a kind of John Major interregnum, a downward spiral, corrosion, chaos. Now there are rumours of one last twist in the story, perhaps even a shot at redemption. Lampard will show his tiny grandkids that Ayia Napa video, chuckle, and say, but let me tell you how it ends..
After Hoddle, after Ericksson, came the calls for a manager who understood the players, who showed his passion: a traditional man who could motivate the team, a bulldog. And this we learn, like Micah Richards, from Capello: that there are no traditional bulldog managers left in England, that these, like so much else, we now have to buy in from abroad. When Sven Goran Ericksson put out his first squad back in 2001, it sprang surprises, not least for Charlton’s Chris Powell. Powell was an effective left-back for England until Ashley Cole was ready (at the time, he was another surprise – too young, too inexperienced, it was thought by many). There are none in Capello’s first essay, just confirmation of dolour for Beckham and Robinson. Beckham’s the victim of the US football season being out of sync with our own. Robinson, on the other hand, may be watching his entire career unravel. There have been comments made this year by former England keepers about the attitude of the new generation to training, learning and development – not complimentary ones, and although these comments haven’t been levelled at Robinson personally, nevertheless they give plenty of food for thought. Robert Green can clearly forget all about England now, failing the absolute demise of every other English keeper. His omission, Beckham’s and Robinson’s aside, is Capello’s main departure from the Ericksson template. Otherwise, it’s clear that Capello’s brief time in England has led him to agree with the Swede: there really is only this core group of players who are up to international level, plus twenty or so hangers-on to this tasting menu of a squad. Likewise Jermaine Defoe. It’s temperament with him – he combines his individual standoffishness with a reluctance to work on his game, with the result that his runs and positioning are no better now than they were when he was a teenage prodigy at West Ham. I’m not surprised by Curtis Davies’s inclusion. His famous “pub footballer” interview, combined with some good recent performances, mark him out as someone with the right attitude to go with his talent. If he keeps this up, a long international career could await him. And, given the sheer number of Aston Villa selections, perhaps domestic trophies to boot. Martin O’Neill is building quietly, but it’s bearing fruit. And it’s good to have Capello mention Walcott, Hart, Wheater and Lennon by name. Walcott and Lennon are on the verge of becoming for real what they have promised to be since 2006 – truly exciting, exceptional players, but both need a bit of luck at the moment. The boost of being singled out for mention will help them. Wheater surely won’t be out of the full squad for long, and there are rumoured to be others to follow from the excellent Middlesbrough youth set-up. I saw Hart play against Sheffield United, and, comic disaster with balloons aside, he looks like a proper keeper. There’s a presence about him that wasn’t so evident with Robinson and Green. It’ll be interesting to see who of Kirkland, Carson and James get the nod against Switzerland. Overall it’s a defensive squad, with more out-and-out defenders compared to midfielders than we saw under McClaren. Hargreaves or Barry will fight it out for the defensive midfield role, presumably behind Gerrard who looks as if he’ll pick up the armband in the absence of John Terry, unless Alex Ferguson’s proffering of Rio Ferdinand comes through. There was talk of Michael Owen joining Beckham on the sidelines, but in the end, common sense won out. The doubts expressed about Owen mystify me: when he returned to the colours last year, it was to bring yet more goals. No other England forward does that so reliably. It looks bad for Dean Ashton, though, who must – like Robert Green – be wondering what he has to do, what fates he has offended. But for injury, he’d have gone to the 2006 World Cup instead of either Walcott or Crouch. McClaren was on the verge of picking him, when injury came again. At one stage in 2005-6, he looked like a younger, more skilful version of Alan Shearer, an old style English centre forward but with subtlety. Likewise Andy Johnson and Darren Bent. Neither has done anything since 2006 to contradict Ericksson’s judgement of them as, essentially, journeymen. Bent is injured at present, after having come so close to scoring against Croatia, but given what’s happened to Defoe, it will be interesting to see if he is picked when fit. England’s over for Johnson, the Kevin Phillips de nos jours. Anyway, what do you think? Good squad, bad squad, meaningless? Who are the missing men? Do we learn anything significant about Capello’s ideas for England, or does that await the first of his actual elevens? Is Sol Campbell’s back injury the only reason for his absence, or is his England career over too? Before I start my post-mortem, spare a moment for the British press. They didn’t want Owen Hargreaves. Will any of them now admit their error, or will they fall back on saying that he’s “won over the fans”? They didn’t want Crouch. And no other manager besides Sven would ever have picked him. Or stuck by him. Will any of them now admit their error, or will they fall back on saying that he’s “won over the fans”? It’s not that the central midfield – Lampard and Gerrard – failed to play together; they failed to play at all. Hargreaves – allegedly in the holding position – took on the Portuguese last night; his team mates didn’t, and haven’t all the way through. Gerrard’s very obvious angling for the glory goal in the last part of the match instead of finding a better-placed team mate said everything about why he’s considered such a hero: it’s Flashman heroism. Lampard simply fell short altogether – I suspect both mentally and physically very tired after two quite astonishing seasons. Every man has his limits. That Gerrard and Lampard fluffed their penalties isn’t really to do with anything else, but was of a type with everything else that they’d come up with. I agree with Sven – two such good players should be able to work it out between themselves. So, ego on the one hand, exhaustion on the other. The injuries to Rooney and Owen were decisive. It’s something of a myth that there are scores of international-ready strikers whom Sven might have taken, and I feel that the criticism he took on this account was harsh. This is especially so when you consider Crouch, of whom more anon. The most obvious candidate, Jermaine Defoe, is not a team player, and not necessarily someone you want in your camp over the course of a tournament – the same consideration, allegedly, that did for Robbie Fowler. But Fowler had a good international scoring record; Defoe’s is some way short of Crouch’s, and of the two it’s clear who has the big match temperament. So, injuries to Rooney and Owen were always going to be catastrophic. Imagine Brazil without Ronaldo (who, overweight, still outperformed every other Brazilian in the end) or Ronaldinho, or, in England’s case, both. I feel that the referee handlied the Rooney thing badly – failing to whistle at all during the long physical assault on Rooney by three Portuguese players, then applying the law to what might have been an accidental stamp in the most draconian way. He’d also failed to give England a cast-iron penalty – but otherwise, I felt he had as good a night as might be expected in such a difficult match. The draw didn’t suit England – just as Brazil’s relatively straightforward one didn’t suit them. “Easy paths” just aren’t for us – I felt sick when I saw who we’d been given in the first round. England respond to challenges – we are better off by far in a group of death. As it was, we arrived at Portugal having – as someone wisely said – played four meaningless friendlies. After Rooney’s sending-off, suddenly the challenge rose to the team’s level, and, with the exception of Lampard and Gerrard, we played. Before the game, Jose Mourinho said that whoever lost could go home knowing that they’d lost to a good side. That was kind, but in all truth Portugal were very lucky last night – only Simao showed any real endeavour, and for all the passing around our penalty area late on, it was very apparent that no one in the Portugal team had any idea what to do with the possession they were receiving. Penalties were a minefield for us, but they were Portugal’s best hope. Owen Hargreaves. I wonder how many of the wise men of the press will issue mea culpas today? I suspect none – they’ll act as though it was only a matter of the fans not seeing what they’d seen all along (and mysteriously not written about..) He put Lampard and Gerrard to shame. Without a fixed place in the side, he performed well every time, making a mockery of the more famous midfield pairing’s behaviour. Peter Crouch. No other manager would have picked him, let alone taken him over and above Defoe. I doubt he’ll play much for England in future. But he was magnificent when called upon – one glaring miss, that was played up because his name wasn’t Owen, but otherwise an excellent goals-to games ratio, huge contribution to the team, and forty minutes last night that rose above even that. David Beckham. It’s now clear that nothing he can do will win him back the press, but given the press’s “success” at predicting the performance of my first two players of the tournament, that can’t really be a problem any more. Remind me of Lampard and Gerrard’s joint goals-and-assists total, then place it next to Beckham’s. Sven will now be a villain in English football history. The man who squandered the golden generation. It’ll be nonsense – and as we pass from the recent era of relative optimism to four or more years of real mediocrity rather than the imagined kind, there’ll be the odd member of the press pack who’ll look back. This will be a time of might-have-beens. With more luck, and we have not been lucky, we might now be looking at two World Cups and one European Championship. Without the luck, but with a bit more from the centre of the park, we might have been looking at two World Cups and one European Championship. The consistency with previous failures is there – the failure to push up, to defend too deeply, is still, infuriatingly, there, and it’s been there for the whole of my adult life. And the failure of great players to get a grip – something Hargreaves’ second coming last night illustrated all too well. If he can do it.. but that question won’t be answered now. We’ve gone out of the best World Cup of the modern era, thank heavens. That deserves to be remembered. You have your English coach now. Not the one you wanted – the English coach you preferred was Scolari, or O’Neill, of course, or failing that, Mr. Tomlinson. But may you enjoy the extra patriotism that we had under Keegan, under Taylor, under Robson when we failed to qualify for the 1984 European Championship, under Hoddle in the early stages of the Euro 2000 qualifiers… no doubt that will prove the missing part of the jigsaw. The changes can be accounted for thus: Seaman retired; Campbell, in the squad but form affected; Barmby, effectively retired (chose to play for Hull City for personal reasons); Scholes retired, and injured for much of the season anyway; Heskey, form. In short, one change over five years because of form. Compare that to “English” managers Revie and Taylor. You can look forward no more to the early introduction to the international scene of players who are young but good enough. Compare Hoddle’s treatment of Michael Owen to Erickson’s treatment of Ashley Cole, Rooney, Joe Cole, Stewart Downing, Aaron Lennon and now Theo Walcott. It’s back to being the underdog again. It’s what the press secretly prefer. With a few exceptions – the usual ones (the names Henry Winter, Jim White and Simon Barnes spring to mind, although not Patrick Barclay this time) – the press just don’t seem intelligent enough to handle our team being front-runners. Where, incidentally, were the “brave substitutions” from Scolari last night that were going to turn the game? Sven’s were better, weren’t they? Well? All this is rather sour, and I’d prefer to end on a different note. This is still a magnificent World Cup – and the match between France and Brazil last night worthy of any. I feared that Domenech was committing suicide for his excellent side with crazy substitutions, but France pulled through regardless. It’s a magnificent World Cup, and there are still 4 games to look forward to.